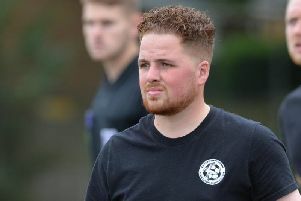 Harborough Town boss Nick Pollard insists his team are ‘not going there to make up the numbers’ when they travel to league leaders Peterborough Sports this weekend. Sports have dominated the UCL Premier Division this season with just six points dropped from their first 19 games. They have already scored 75 goals – including seven in last weekend’s win over Wellingborough Town – and will provide a very stern test for Harborough. But Pollard expects his team to go their and give their hosts plenty to think about. “We’re not preparing just to go there and lose,” the Bees boss explained. “They are a very good team with players who should be playing two levels above this. “They beat us 6-0 at our place so we know how good they can be. “But they are not unbeatable. They have lost twice in the league and been beaten in the cup. “We’re not going there just to make up the numbers and will give them as good a game as we can. “I think some teams go there and try out some new things and maybe not believe they can get the result. “And it will be a very, very tough test for us. “But as long as my players give it all they have got there will be no complaints from me. That draw against Holbeach came on Saturday but Pollard admitted it felt more like a loss than a point gained. He added: “We absolutely dominated the second half and were 2-1 up. “But then, as teams do when they are chasing a game, they threw everything at us in the last few minutes. “Then, with about 10 seconds left, they got a free-kick on the edge of the area and the lad has put it in. “I went into the dressing-room afterwards and the players were absolutely gutted. “If I’m honest I would probably have taken a draw there before the game but that just felt like two points dropped. “The players put in a fantastic performance and gave a great account of themselves but it was difficult to take. “I have to be happy with where we are, though. “We’ve taken 36 points from 18 games which is very good. “We’ve come from a side in relegation trouble, to 11th last year and now sixth.